It has been two weeks since the last jewel of the elusive Triple Crown and what do you know, there is still racing going on. The three-year-old division, which has been the focal point of the first six months of the year, is still wide open. So are the less recognized divisions, which up to this point is every other division going. Paddy O’Prado was one of the best of the turf division last year and made a promising return with a victory in the Dixie, he was injured shortly after the finish of that race though. Gio Ponti made his stateside return on Belmont Stakes day in the Manhattan and the boggy turf, not one of his better surfaces, did him in. Since his 2009 championship season it looks like he has lost a bit of his closing kick that strung together four straight grade one victories. Winchester is yet to race this year as well; he won two important grade one races last year and could be a player if he returns to action this year. Over on the West Coast Bourbon Bay and Champ Pegasus were in some tight heats over the course of the last few months and will probably be the standard bearers for the West Coast contingents. Acclamation recently repeated the Charlie Whittingham/Jim Murray Handicap double that he accomplished in 2010, after that point last year his form dropped off dramatically. It remains to be seen if he can hold up his form this time around. Late last year this division was peppered with longshot winners, Shared Account by way of her upset win in the Breeders’ Cup Filly & Mare Turf is the division leader. It is a tenuous lead though, if any filly can go on a hot streak in the next few months they got the division clinched. The colts and geldings side of this division is extremely deep, Apriority was competitive versus the top echelon of the division in his two tries and was done in by a dead rail in the Churchill Downs Handicap. Morning Line won his only sprint effort this year, the Carter and should be kept at the seven furlong or six furlong tests if the connections like the winner’s circle. Big Drama is taking an extended break after a stakes win at Gulfstream in January and his connections are aiming for a stakes race or two at Saratoga before trying to win back to back renewals of the Breeders’ Cup Sprint. Trappe Shot won the True North by open lengths, in the race before that he faced Rule By Night who ran some big races the previous year and could be a decent under the radar horse for the upcoming stakes races. On the filly and mare side of the spectrum, it looks like Hilda’s Passion is the filly to catch. She has run consistently fast races so far this year. Unless there is a fleet three year old filly out there, it looks she will have it her own way for the rest of the year. Last year Havre De Grace and Blind Luck faced off four times, Blind Luck was ahead of Havre De Grace in three of those encounters with the average winning margin being a quarter of a length. This year in their only meeting Havre De Grace was three lengths clear of her rival at Oaklawn in the Azeri. Blind Luck has gotten back to her winning ways recently with victories in the La Troienne and the Vanity Handicap. Awesome Maria is perfect in four starts this year, but the fields she has faced so far this year have been less than stellar. Her win in the Shuvee Handicap was over a surface that was faster than normal as well. She will likely be over bet when she has to face some of tougher competition. The three-year-old section of this division is another wide-open division. Three returnees from the Kentucky Oaks run yesterday and one was victorious, Zazu. Plum Pretty was supposed to run in the Mother Goose and came down with a fever so instead she was entered in the Hollywood Oaks. Zazu was in the Hollywood Oaks as well and benefited from a four-pound weight shift on Plum Pretty. Joyful Victory was the heavy favorite in the Mother Goose and disappointed her backers. Buster’s Ready benefited from an inside trip and posted a four-length victory in the Mother Goose after facing Royal Delta in the Black Eyed Susan. Much like the male counterparts, the title will likely come down to the last few major races left. With the retirements of Lookin At Lucky and Blame from last year, this division is will be a battle royale down to the end. Last week Pool Play came from out of the clouds to capture the Stephen Foster at 36-1, Apart won the William Donald Schaeffer on the Preakness undercard, and First Dude won the Alysheba on the Kentucky Oaks under card. From the looks of it, if Zenyatta was to come out of retirement to avenge her Classic defeat from last year, it would not be a tough task to pull off. The same theory would go for Lookin At Lucky as well. Parity in the divisions is not all terrible though, it certainly makes things more interesting from this point on with each race increasing in importance and the chances of a nice payoff on a strong opinion of these races very likely as well. With the Versus channel showing the premier events from Saratoga and the chances of some very crucial races to be run, this can be seen as a boost to a sport that could use all the help it can get. Time for more saturation of the already over populated two day and now 15 race Breeders Cup program. The new race on the schedule is the Juvenile Sprint that is open to the colts, geldings, and fillies. It also carries a $500,000 purse which doubles or triples all other juvenile races around that time period including the Iroquois and Pocahontas from Churchill and the already depleted stakes races of the Nashua and Tempted stakes from Aqueduct. Thus drawing away from even more stakes races run in the fall. This isn’t even the interesting part of the story; there were two remarks that were made that stuck out from this stub of an article. First off the comment by Mr. Willmot, the juvenile division is just the juvenile division. There was no split between the sprinters and routers at this point like their older counterparts featured in the other races. 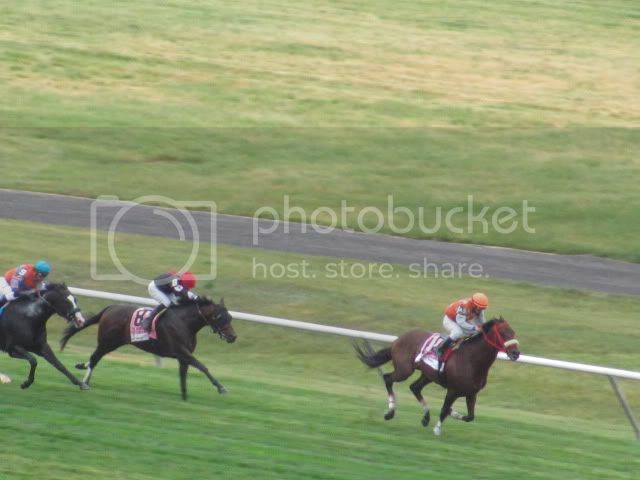 Most of the races around this point in the year are seven furlongs or longer as well, there is very little in the way of established sprint races for the newly minted thoroughbred runners. 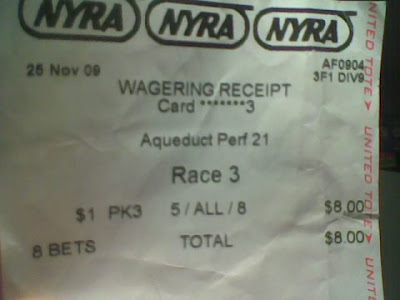 NYRA used to have a pair of sprint races that they ran in October called the Cowdin and Astarita; they were discontinued due to the Breeder’s Cup and a lack of entries. Do you know what this race will feature? Mostly horses that just broke their maidens and are Breeders’ Cup nominated. More than likely it will be a highly pursed n1x allowance. Murphy mentioned that there is a group of juveniles that are not ready to go two turns or the 8-½ furlongs that the two mainstay juvenile races are established at. Doesn’t that apply to 90% of the horse population at this point their career anyway? Even the established routers from late in the season last year turned into busts this year Uncle Mo, To Honor and Serve, and Awesome Feather did not transfer their form to this year after showing two turn prowess last year. Two out of the last three Derby winners were turf or synthetic winners as two-year-olds in addition to this. If distance were such an issue it would make more sense to shorten the big two back to a one-turn mile or seven furlongs. The 7/8 of a mile distance seems to be a stretch for most of the horses entered in the two mainstay juvenile races anyway. Lastly, the two day 15 race mega-card of the Breeders’ Cup probably has a few too many races. The Marathon was added as a way to “encourage” racetracks to add long distance races to their programs. From the looks of it, the effort made by racing secretaries is minimal. 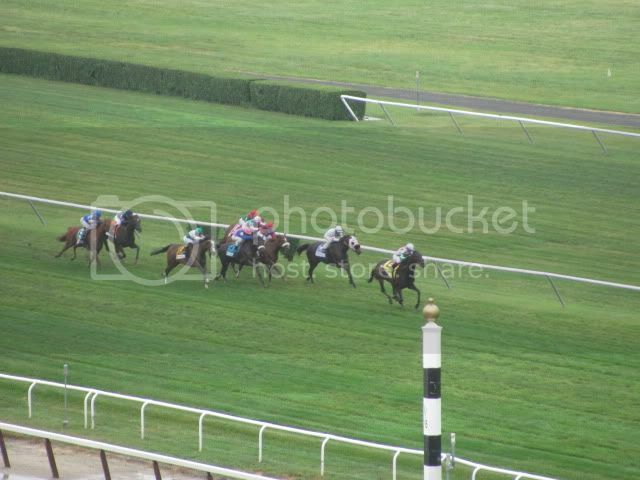 There is little in the way of recognizable long distance races outside of the Brooklyn and the Greenwood Cup Handicap. If there was any kind of effort put in by the major tracks there would be at least two competitive options a month for runners at this distance. This race is seen as an afterthought where a trainer will throw a runner if they ran good in a lesser prep or were beaten badly in one of the major preps. Back in 2005 there were only eight races featuring the best of the best, an overload of races and a burnout of the races that act as preps for the big day have diluted the Breeders’ Cup program. Adding even more races will not fix this problem. 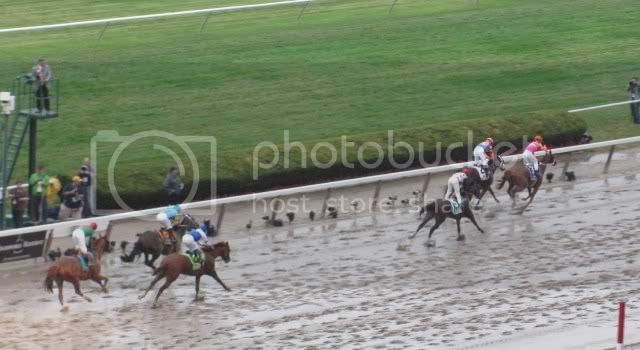 For the first time since 2003 the Belmont Stakes card was contested in the mud. Bad weather and longshots won the day. Only one of the six betting favorites won and it was Trappe Shot in convincing fashion. Otherwise, if you bet against the public, you made out well for the day. The Acorn was a prelude of what was to come with the odds-on Turbulent Descent going down in defeat to It's Tricky, who was coming off of a wide journey in the Florida Oaks against the classy R Heat Lightning. Turbulent Descent was three lengths behind the winner and ten lengths in front of the show runner. It should be noted the the dirt strip had a pronounced speed bias just from the first glance at the full charts as well. The True North was all Trappe Shot, chances are there will be a race between Big Drama and Trappe Shot in the near future at Saratoga. Below is the last point in the race that anyone was close to the winner. Justin Phillip was up against the class of his division for the first four months of the year facing Mucho Macho Man, Vengeful Wildcat, Adios Charlie, and Astrology in graded stakes action. So far the Jerome has been an effective key race with Astrology finishing third in the Preakness and Adios Charlie getting nipped in the Peter Pan. This race was beaten up a little bit with the scratches of the royally bred Bold Warrior and Little Drama, reducing the field to five runners. The two grade one turf races had two things in common, the winner was no worse than first at any point in the race and they were both tote board busting winners. C.S. Silk had a career resume that had a place finish in grade one company last year at Keeneland chasing home the dominant Proviso, yesterday she took advantage of a paceless race and wired the field. Mission Approved is an incredible story when you look at his record, his most recent effort was July 18, 2010 where he almost upset Gio Ponti and before that mostly placings in NY bred stakes company with a win against $40,000 claimers to his credit. Gio Ponti has had a bad history on less than firm turf, he has lost twice as a favorite to two massive longshots. Before today, he lost the 2009 Turf Classic to Interpatation after holding a slim lead in the stretch on a soft surface. Speed ruled the mile and a half races for the weekend at Belmont. Ruler On Ice was up close to Shackleford early and had enough left in reserve to hold off Stay Thirsty and Brilliant Speed to cap off a longshot laden series of three year old stakes races. Animal Kingdom encountered a bad trip from the starting bell and never got closer than fourth after a sustained drive from the half mile pole to the eighth pole. It remains to be seen how much the triple crown has taken out of the main players as well. Shackleford gave his all and was done in the stretch with just enough out finish Animal Kingdom. Mucho Macho Man was a non factor from the mile marker to the finish line finishing 24 1/4 lengths behind the upset winner. The Friday before the Belmont was Mott's day to reign supreme in the two featured stakes races. Courageous Cat had no problem coming back from the October layoff and chasing down the loose on the lead Yield Bogey. Courageous Cat was second in the 2009 Breeder's Cup Mile to the legendary mare Goldikova and since then has only seen competition four times including Friday's victory. If this horse can keep it together, he will be a force to be reckoned with. The Brooklyn Handicap was Drosselmeyer's attempt at winning both mile and a half stakes races offered for the Belmont meet. It was not to be, as the uncoupled Mott entry Birdrun led the field of five wire to wire with the 2010 Belmont winner chasing the whole way. In recent years the Brooklyn winner has been a horse that usually needs long distance races in order to be successful. Birdrun has wins at 9 furlongs or shorter before this victory and could be a force in the handicap division if everything breaks right. Nice card at Belmont today. Hopefully the rain does not decimate the races and most importantly all horses and riders go back to their barns safely. This is the one day of the year when the racetrack crowd in downstate New York is not dominated by old degenerates. It is nice to see some people from outside the typical demographic enjoy the races. It looks like trainer McLaughlin can plan to make a more than one trip to the winners circle on this card. He has three likely winners; none of them are going to be great prices but they could be a safe heaven in a long program. In race one Marine Officer -dam was NY stakes winner Asti- should crush this field. She has class and a class turf horse like this usually has little problem winning off a layoff. In race four Rattlesnake Bridge has a rare five furlong work-McLaughlin usually works them 4 furlongs when they work 5 furlongs that signals readiness- this colt just towers over this field. Race 7 will be Trappe Shot's unveiling as top sprinter in the country. Like Rattlesnake Bridge this colt has a five furlong work signaling readiness. This looks like a wide open race. No real standout here but Much Rejoicing is a filly that could win the"Just A Game" at a generous price. Race lacks pace which plays into Much Rejoicing's wheelhouse-this filly is used to pressing fast paces in sprints. Look at how this filly has done so much in such little time. Races on dirt, over pol track, over turf, then trips to Florida, New York, Canada. Then she completes her education with run over wet tracks, fast tracks and then turf. She has been liberally educated in the racing arts. She has shown that she has class and can run over broken bottles if needed. Today is the day she can apply that broad education towards a trip to the winners circle. Hopefully we can go for the ride alongside her. Standout horse here in Prince Will I Am. Bet with him and you could feel like a king. The cutback from those marathon races in Florida should have this horse stout and strong in the homestretch. 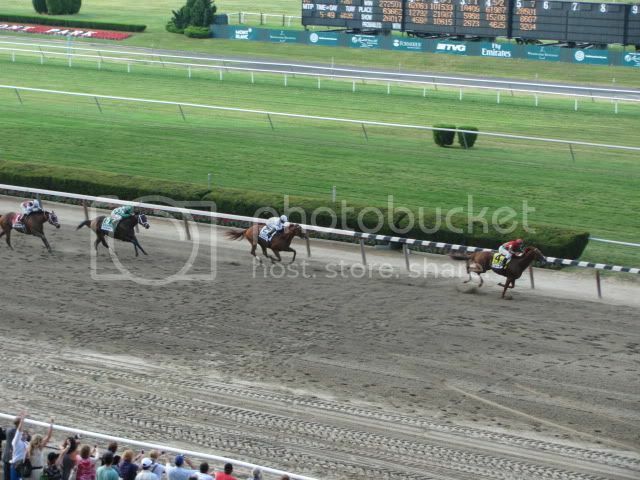 The Prince loves New York with a grade one win over this very track last year along with a win at the Spa. Race sets up nice for him. A cornerstone selection to build your castle around. Wide open race this year that looks interesting. Sometimes this race can be an afterthought. The early wagering has the public hammering down on Master of Hounds. The American raceing public has had this affection for Aiden O'Brien and the horses he ships from Ireland to run stateside. Unfortunately for the public Mr. O'Brien has not returned the favor with no wins in the last five years. Is this the horse to break the streak? Maybe it is better to let that long streak of futility to continue with someone else's money. My longshot pet pick is Santiva. He is bred for this long trip and has run well in all of his dirt races. I like the preparation he has received taking five weeks off to prepare for this race from the derby. He is going to be my key horse that will be used with others in multi race wagers and trifectas. Prime Cut is another horse here that will run well and surprise many with his talents of mobility. Since Santiva is no lock with will also use Animal Kingdom, Mucho Macho Man, Prime Cut and money burner O'Brien's colt Master Of Hounds. 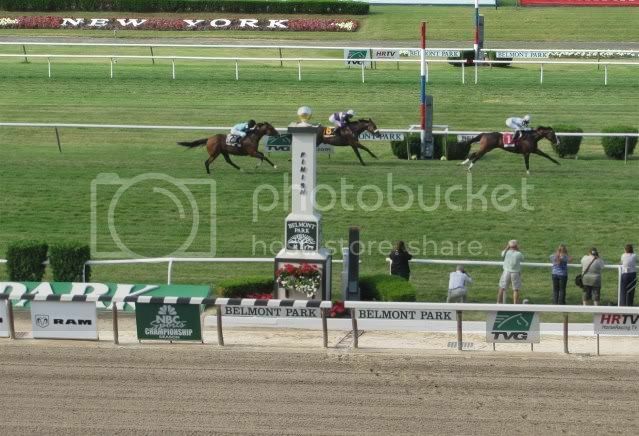 The Belmont Stakes is often a race were the public hones on a Derby and Preakness winners only to be surprised when a new shooter upsets the field. Just in the last ten years six bona fide longshots have made Belmont Stakes betting a true bonanza for those picking the winner. Those that selected Sarava at 70-1, Da Tara at 38-1, Birdstone at 36-1 or even Drosselmeyer at 13-1 were rewarded handsomely. The Belmont is a race for longshots. 12 furlongs is an unusual distance that yields unexpected results. This year the surprise horse looks like Santiva. Santiva beat our Preakness pick Astrology(who ran a credible third) in the Kentucky Jockey Club in a game performance. Santiva was squeezed like a lemon between horses. Instead of yielding lemon juice Santiva gamely responded by winning. This horse ran a valiant sixth in the derby while never really having any room. His race on the poly in the Bluegrass -a bizarre surface where races can be ignored- is a clear throwout. The trainer Eddie Kenneally is a top shelf trainer and Santiva is bred to win going long by sire Giants Causeway. A smooth mover who should be close to the pace Santiva is going to run great at around 15-1.